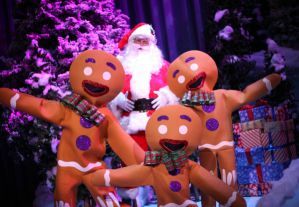 Home > News > News > The Christmas Show Is Coming Soon! The Christmas Show Is Coming Soon! This year’s show will run through December 30 and will feature a brand-new presentation of the songs and traditions you know and love, along with spectacular vocals, fabulous dancing, lots of light-hearted moments, and a visit from Santa himself. It’s never too early to plan your holiday trip to AMT with family and friends. There are almost 90 Christmas Show performances to choose from, but don’t wait too long to get your tickets … your favorite date could be sold out if you do. Make plans now to join us for The 2012 Christmas Show – “Home For The Holidays.” Call the Box Office at 800-648-4102 or click here to get your tickets now.